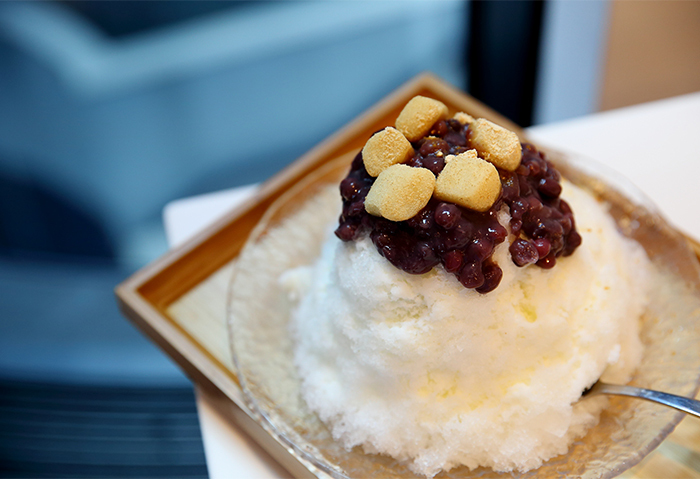 Bingsu (shaved ice with toppings) is a popular snack food found almost everywhere in Korea during the summer months. 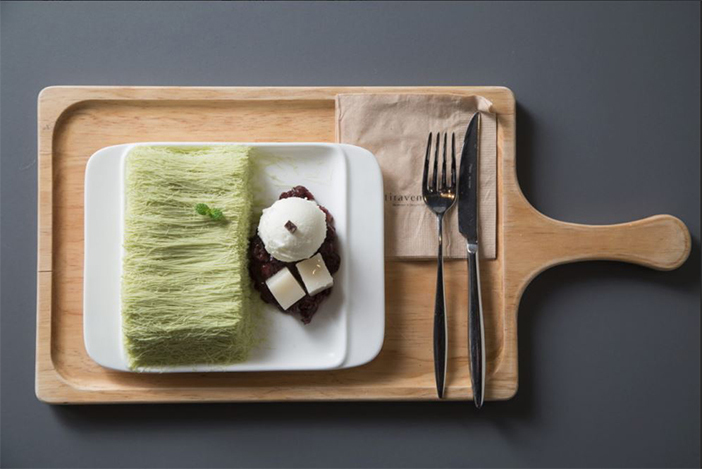 As it becomes a heavily dominant menu eaten across the nation by many Koreans and travelers seeking unique eats, lots of dessert businesses are coming up with more creative concoctions to delight their customers. To beat the sweltering heat this summer, let’s indulge in some of these tasty treats known to be the best of the best! Read on to find a variety of places where you can explore endless diversity of bingsu and flavors. 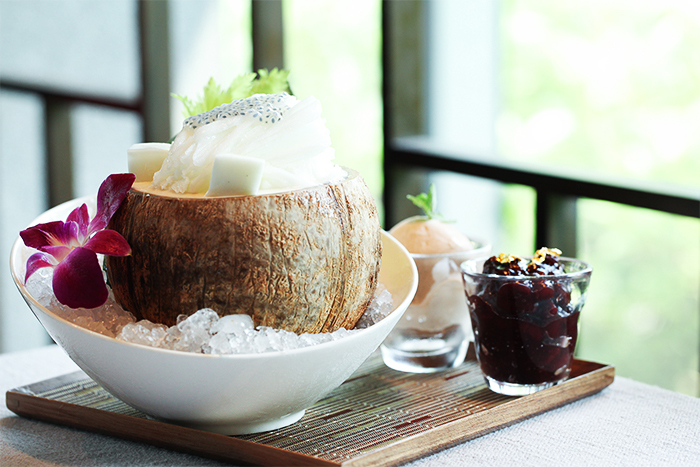 Believed to date back all the way to the Joseon Dynasty, the original bingsu was simple, served as finely broken ice chips topped with sweetened red bean porridge. The beans sit aloft a mound of thinly shaved ice chips flavored with a mixture of milk or condensed milk. Finishing with a garnish of choice, such as nuts and seeds, these toppings give the bingsu texture as well as nutritional supplements. The most popular bingsu found are those topped with misutgaru (roasted rice and grain powder) or served with generous pieces of chewy rice cake, completing a flavorful taste sensation. Today, many bingsu shy away from the predominant red bean taste and some even omit the red beans altogether. This modification is especially welcomed by those who cannot eat red beans (also known as pat in Korean). The fruit toppings, whether freshly diced or added with honey and syrup, go so well with shaved ice, they make a perfect combination that will have you craving more. 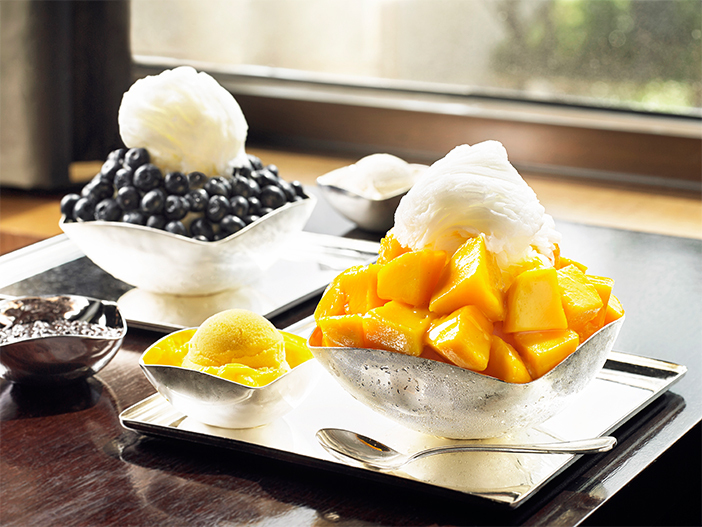 Recent popular fruit bingsu are those with shaved ice made of fruit or fruit extract, maximizing the fresh fruitiness. Flavors greatly depend on the main ingredient, options ranging over a wide variety of fruits, including mangos, strawberries, grapefruits, etc. Fruit bingsu may not be as sweet as the classic pat bingsu, but will melt in your mouth all the same and offer a burst of refreshing fruity flavors until your last scoop. For the health-conscious or those seeking unique flavors, healthy bingsu is the perfect choice. Topped with generous chunks of sweet pumpkin, jujube or almond, just by looking at these nutritious ingredients will make you feel healthier. In particular, hanbang (medicinal herbs) bingsu includes nutrient-filled ingredients such as gugija(wolfberry fruit), yulmu (Job’s tear), odi (mulberry fruit), nuts, and cinnamon powder, and has a similar taste to traditional Korean tea sujeonggwa (cinnamon punch). 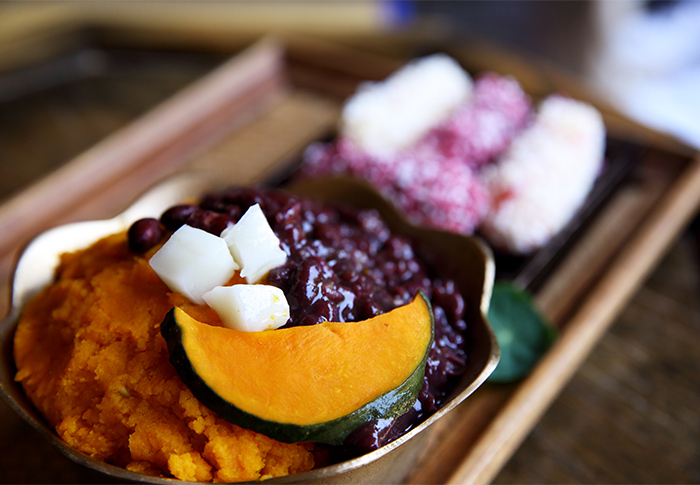 Even sweet potatoes create a refreshingly sweet harmony together with shaved ice when served as bingsu. Purple sweet potato bingsu is especially pleasing to the eyes due to its gorgeous color. Take a closer look as you walk along any street lined with shops and you just might find special bingsu rarely seen in ordinary cafes. The shiltarae bingsu tastes as great as its interesting appearance of threaded ice, while cacao bingsu steals the heart of chocolate fans with its strong, rich flavor. Dango bingsu is topped with dango (Japanese-style rice cake) for an adorable look and chewy texture. These unique bingsu are attracting a lot of attention from the young generation, as they are not only visually appealing but taste heavenly, too! * This column was last updated in June 2018, and therefore information may differ from what is presented here.